Logan Jaffe, Temple Shipley, Katrina Nygaard, Justin Manley, James Baatz. 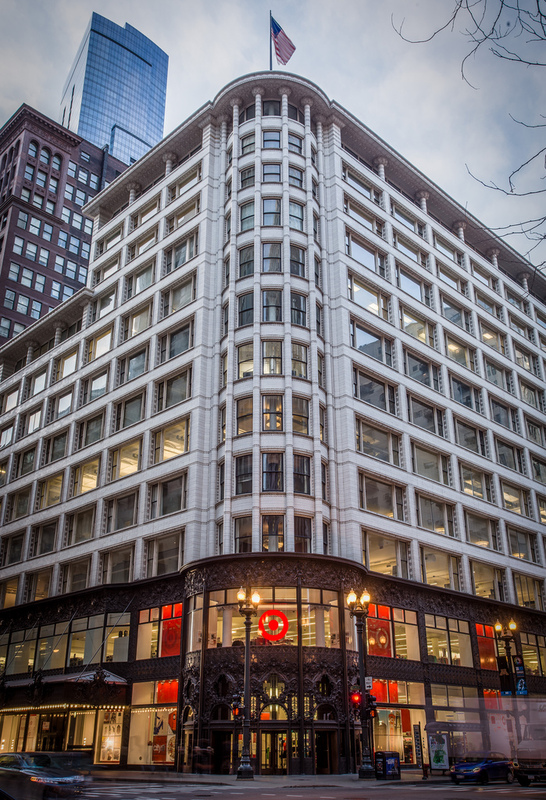 The Louis Sullivan building appealed to the Target Corporation because its architecture strengthened the Target brand, which is 'very much about the design of objects,' says a Target spokesperson. Chicago's CityTarget is particularly catered to urban consumers. CityTarget opened in the former Carson, Pirie, Scott and Company Building, now the Sullivan Center, in 2012. The building was designed by Louis Sullivan and opened for retail in 1899. Editor&apos;s note: This story was produced through a collaboration between Curious City and a University of Chicago class called "Buildings As Evidence," taught by professor Sarah Lopez. Reporting, writing and production contributions from Temple Shipley, Katrina Nygaard, Justin Manley and James Baatz. The city of Chicago is a well-known hub of historic architecture, architectural tourism, boat tours and rabid debates over building preservation. So what happens when this architectural pride has the potential to get dented by — of all things — retail buildings targeted and designed for exurbs, suburbs and strip malls? This is more than a hypothetical issue because in recent years big retailers have been expanding into urban markets, the Windy City included. The property-quest stories of stores like Target, Walmart and local stalwart Walgreens, for example, aren’t necessarily new. After all, many corporate retailers even say they design stores to be built (or even demolished) easily, and they often start from scratch when operating in the suburbs. In the last year, though, some companies have chartered new territory in older, existing spaces — particularly in cities with deep-rooted architecture like Chicago. Katrina Nygaard used to work at the intersection of Damen, Milwaukee and North Avenue, right where a Walgreens opened in a historic and long-abandoned bank building in 2012. She knew that surrounding neighborhoods Wicker Park and Bucktown had a tendency toward historic preservation, but she still questioned the motives behind big, corporate retailers to jump on the local bandwagon. What’s driving the decision for some retail corporations to reappropriate old spaces in urban areas? With help from Katrina and her University of Chicago classmates James Baatz, Temple Shipley and Justin Manley — who collaborated with Curious City as part of a course called “Buildings as Evidence” — we learn how a corporation’s deep pockets can help sell us our own city’s history as well a Cubs T-shirt in the check-out line. Katrina, our question-asker, says she’s particularly interested in why retail corporations appropriate historic spaces. That’s especially the case for the company’s CityTarget locations, a small batch of “re-imagined” stores designed for the mostly-carless, grab-and-go lifestyle of the company’s increasingly urban customers. Six CityTarget locations opened in 2012 across the U.S., one in Chicago’s century-old Sullivan Center, formerly the Carson, Pirie, Scott and Company building, downtown. CityTarget’s goal? To bring the suburban experience to the urban guest, says company spokesperson Erika Winkels. “You’re not going to find a 30-pound bag of dog food in a CityTarget location,” she adds. And that makes sense. Who wants to wrestle an oversized bag of Lamb Meal formula down State Street? But that logic — simple as it seems — actually took a long time for corporate retailers to act on. It took mass migrations of people from suburbia to cities, monumental changes in consumer preferences and (maybe) a fight or two from local governments before key retailers looked beyond the big-box to smaller, variety-packed oases. Corporate America’s recent realization to reappropriate urban structures is worth tracing because it suggests a new attention to brand identity and design that’s forced to coexist with the built environment. In most cases, that hasn’t happened before. When companies with strong holds in suburban markets (say, Target, Walgreens, or Wal-Mart), move into urban space, they’re moving away from a business strategy that&apos;s borne their financial success. A lot of that financial success comes from having tight control in areas without much external pressure from the community or local government, says Zeb McLaurin, the developer of the new Target store on the former lot of Cabrini Green. The availability of space in the suburbs has allowed many national retailers the freedom to develop unique formulas for maximizing profits, he says. This formula’s worked, McLaurin says, because the companies can replicate it. Ninety percent of Americans live within 15 minutes of Wal-Mart, and the corporation is ranked number 1 on the 2013 Fortune 500 list, according to Fortune Magazine. Walgreens and Target are also ranked within the top 50. But their replicable recipes for success caused some problems, too. So, some corporations followed their customers in toward the city, Eakin says, a move that traded some of that control for access to new markets. He says he experienced this in his own community. Ironically, it was the Walgreens Corporation — which actually began its own history near Chicago in 1901 — that was met with tight building restrictions and demands from his community when it tried to demolish a historic storefront. Eakin lives in the Village of Oak Park, on Chicago’s western border. When he heard Walgreens was slated to open on a historic corner there in 2011, Eakin dreaded it. After all, noted architect Frank Lloyd Wright began his career in Oak Park and built several homes, including his own, in the area. While Oak Park isn’t necessarily “urban,” it is historic. And many residents want to keep it that way. It’s no surprise, then, that some Oak Parkers fought against Walgreens opening in the Collins Building, which has stood at the corner of Madison Street and Oak Park Avenue since 1922. They eventually reached an agreement with Walgreens that would preserve the building’s facade. It was the first Walgreens store to reappropriate an existing structure. Given constraints from local government, Walgreens developers and architects were forced to rethink traditional store structures. Walgreens even documented the process and its take-aways in a presentation called &apos;Reinventing the Retail Drugstore&apos;. The store was an immediate success when it opened in 2011. It featured geothermal heating, solar-powered hand dryers and LED lights. Corporations flew their CEOs from all over the country to take a look at the Oak Park store, and it was also filled with local customers, Eakin says. Flash forward a few years, and corporations across the country are moving into old buildings. Oak Park’s success proved there was money to be made in adaptive reuse. So, some companies decided to take advantage of the new frontier and move into empty Chicago buildings, but without pleas from the local community. 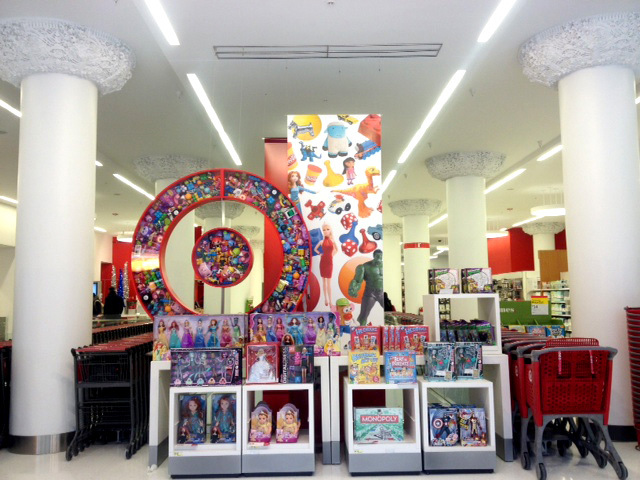 Last year, Target debuted its Chicago CityTarget store in the century-old Louis Sullivan building on State Street, while Wal-Mart opened an “express” branch in an old Pearl art supplies store off the Chicago Avenue Brown Line stop. Walgreens, too, opened an urban store in the landmark Noel State Bank building on Wicker Park’s six corners — the one that sparked Katrina Nygaard’s curiosity. The store’s openings have sparked applause, protest and much discussion in community development and activist circles as well as media. In a way, the adaptively reused stores became architectural spectacles on their own. This is particularly the case for Chicago. We speak architecture here in the city, Masengarb says, so any move by corporations to inhabit Chicago’s architecturally significant spaces is a nod to Chicago’s history and an attempt to connect with a source of local pride. For example, the ornamental terra cotta, bronze and cast-iron exterior of the Sullivan Center, now emblazoned with a Target logo, she says, was meant to be both resilient and attractive when it opened as a retail space in 1899. Louis Sullivan’s building literally defined Chicago architecture. Little wonder, then, why the building appealed to the Target Corporation as it hunted for urban storefronts. And what is the Target experience? “Great design that should be affordable and accessible to all,” according to the most recent slide of an interactive timeline on Target’s website. In other words, corporations that could use existing architecture to promote their own brands began to do so. And this is a new, monumental leap in marketing, considering that only a few years before, Target was stuck in Chicago’s suburbs. Walgreens is another interesting example, as it’s recently used adaptively reused buildings to help reinvent its own brand. The company first opened its doors in Chicago in 1901 as a drugstore, but it soon expanded to the suburbs and added convenience items and cosmetics to its product line. Its company history changed course a bit, though, when it opened a store in the Noel State Bank building on 1601 North Milwaukee Ave in 2012. The new “flagship” store retained much of the building’s original design, including its terra-cotta exterior, ornamental cornices and two-story pillars topped with Corinthian capitals. Inside, the hexagonal skylight, large windows and geometric, terra cotta ceiling were all restored. (You can read more about its renovation on the blog ArchitectureChicago). While the Noel State Bank example does show the potential of corporations to restore historic interiors, most examples of adaptive reuse still point to looser interpretations of historic preservation and they usually involve a building’s facade. As it becomes clear that more corporations are using architecture as a marketing tool, the "architecture" we&apos;re referring to in some cases may be more of an architectural aesthetic than the blueprints, materials, and structural integrity of a building&apos;s insides. Even though Eakin is satisfied with Walgreens&apos; preservation of the 1922 facade in his Oak Park neighborhood, he still calls it "a lobotomy.” Turns out there’s actually a word for the physical manifestation of compromise between property developers and preservationists. It’s called a Facadomy. Walgreens, in the Oak Park case, left only the skin of a building that survived about 90 years on its own. Similarly, Chicago&apos;s CityTarget preserved Sullivan&apos;s original facade, but the store&apos;s interior is a very simplified version of the original design, Eakin says. "You&apos;ve taken out what&apos;s original to it but you&apos;ve preserved the history of the place and street," he adds. "It&apos;s not the same, but it recalls it in a way that&apos;s, to me, pretty satisfying. Because if a building can&apos;t adapt it&apos;s never going to survive." And that&apos;s where we come in. If Eakin&apos;s right, corporations sometimes appropriate old spaces in response to consumer demand. This isn’t demand for, say, avocados or appliances. It’s also not demand in the sense of “community demands,” as seen at the Oak Park Walgreens. Instead, companies expect urban residents desire sustainability, unique architecture and preservation. “You have to fit into the way your customers have changed their thinking about the environment,” says Alan Malter, a consumer psychology professor at the University of Illinois-Chicago. Malter says a few decades ago cities were emptying out, but today that trend has reversed. So, some corporations are following more than their customers’ footsteps; they’re following their customers’ psychology. As one article in the Harvard Business Journal puts it, the recent movement of people into cities is about “more than evolving tastes; it’s at least partly a reaction to real problems created by suburbs.” Those problems include obesity, depression and other health risks associated with long commutes and general isolation. Some of these problems, Eakin says, have been made worse by retail corporations that partly created bland suburban environments in the first place. That may explain why more people are moving to cities, and why urban consumers may be more sensitive to design and architecture. Corporations have to consider some urbanites’ preference for existing structures. Often, however, preservation is just a nod. So, when Malter first walked into Chicago’s CityTarget store on State Street, he says he was expecting a little more. But it still just felt like a Target, he says. And he’s okay with that. To him, the gesture to restore the historic architecture was enough, even if it was splattered with Target logos. “It makes you stop and think for a second that this brand is more sophisticated than I thought,” he says. Despite the advantages of reappropriating old spaces, Malter says he’s not convinced corporations would do so if they didn’t have to — at least in dense, urban environments. That gets to the heart of Katrina’s question about what’s driving some corporate retailers to reappropriate old spaces. It’s money: the same thing that’s always driven them. What’s changed, though, is the tactic in which they’re making it, at least in urban markets. In Chicago, it seems, that new strategy largely involves architecture with deep ties to our city, and how it feels to live here. After CityTarget shoppers step inside between the large, restored pillars of the Sullivan Center, they’re greeted by large selections of Chicago-themed souvenirs. They can buy Cubs, Soxs, and Blackhawks T-shirts, postcards of the skyline, and keychains of Buckingham fountain. A massive sign that reads “Hi, Chicago” is backed by a huge, red wall of Target logos. Even the trash cans have a CityTarget logo on them. And what is the feeling of Chicago, then?